A lot of people dumped all over the 2006 redo of The Omen, as if the original were a masterpiece despoiled by a remake. Truth to tell, the 1976 film — which paved the way for three progressively bad sequels — hasn’t aged terribly well. It plays stodgy and old-school, in marked contrast to maverick William Friedkin’s dance with the devil three years prior. About all The Omen has going for it, then and now, is its freakish death scenes. Gregory Peck and Lee Remick, pitching their voices as though it were still 1958, are ambassador Robert Thorn and his wife Katherine. Their baby has died and been surreptitiously replaced with an orphan child, though Katherine doesn’t know that. The baby grows into five-year-old Damien, a preternaturally silent child (except when he gets near a church) apparently watched over by an imposing black dog and then by eerie-looking Billie Whitelaw as nanny-from-hell Mrs. Baylock. It’s clear to pretty much everyone in the movie except the parental Thorns that Damien … well, as they say on King of the Hill, that boy ain’t right. The script by David Selzer is fastidiously engineered, perhaps explaining why they basically shot it again word for word in 2006. It actually takes the form of a quest narrative, as Peck and skeevy photographer David Warner set about collecting evidence to prove Damien’s infernal origins. Peck seems to take forever to be convinced, even after those near and not-so-near to him have died baroque deaths. Said deaths earned The Omen a place in horror-flick infamy all those many years pre-Final Destination. Audiences couldn’t quite believe that a 20th Century-Fox film starring Gregory Peck was showing them, in exquisite slow motion, a gory decapitation by a wayward sheet of glass. Or a distressed nanny being the ultimate buzzkill at a birthday party. Or a character shishkebabed by a falling church spire. The Omen is a supernatural procedural wedded to sensationalistic National Enquirer splatter (from the days when the Enquirer ran photos of celebrity corpses), and as such, it’s fitfully interesting. The gory bits are like jalapeno peppers sprinkled over oatmeal; even the most nostalgically devoted fans of the film need to ask themselves if it would be so dear to their hearts were it not for the ornate atrocities set to Jerry Goldsmith’s shrieking choir. Not much can be said about dependable hack Richard Donner’s direction here; the proceedings are styleless, impersonal (and paced like death). If you find yourself with some free time, look up Harlan Ellison’s essay about the film (it was reprinted in his collection An Edge in My Voice), wherein he discusses the time he caught an evening showing and was appalled by the audience’s hooting, hollering response to the flick’s centerpiece demise. Ellison is perceptive in many cases, but not this one. Even allowing for the release of tension that often gives rise to “inappropriate” audience reactions, the death scene in question is borderline ridiculous — probably not even borderline — and fairly hard to take seriously. By the time of the Final Destination films, the elaborate Rube Goldberg deaths were consciously designed for morbid comedy. This doesn’t prove the coarsening of modern American audiences so much as simple truth in advertising. 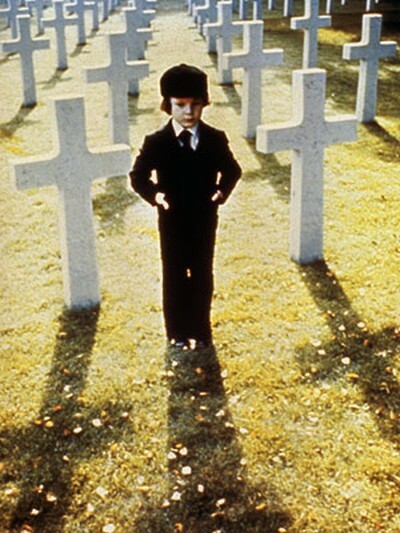 Ellison assumed that The Omen would be a film in which life meant something. He was clearly at the wrong movie. Essentially undignified material given a respectable old-Hollywood patina by its star and studio, The Omen doesn’t play with an audience’s head the way The Exorcist so ruthlessly did. It hauls out the old Satanic verses for easy spooky effect, and rests much of its narrative weight on a rich clueless couple and a very inexpressive child actor. A remake neither honors nor dishonors it: it’s hard to polish a turd or to render it even more smelly.